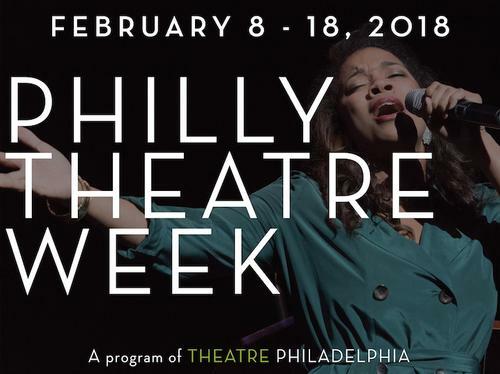 Philly Theatre Week, presented by Theatre Philadelphia, is a 10-day celeration of the artists, organizations, and audiences that have made Greater Philadelphia one of the most vibrant theatre regions in the nation. With over 75 events taking place, there's bound to be something to spark your interest. While many are, of course, theatrical productions, the Theatre Collection of the Free Library is thrilled to be particpating by presenting the pop-up exhibition "A Look at the History of Philadelphia Theatre" in the Rare Book Department at the Parkway Central Library. 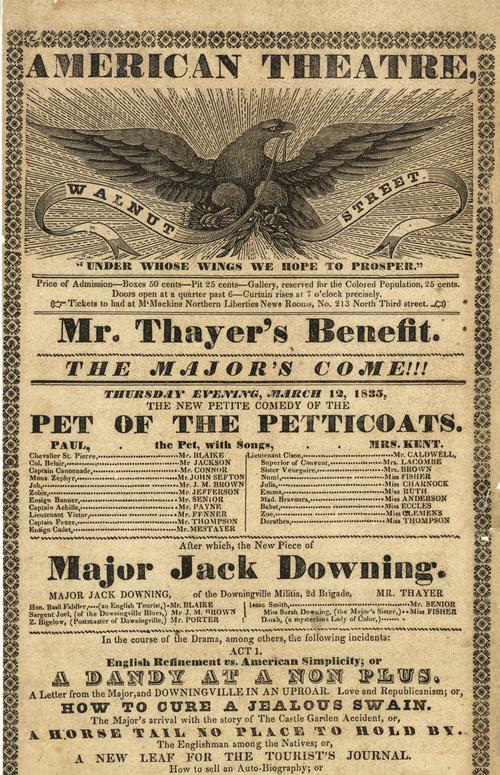 On view Monday through Saturday, February 8-17, 2018 from 9:00 a.m. to 5:00 p.m., the exhibition highlights the history of Philadelphia theatre, particularly the proliferation of theaters in the 19th century and how this mirrors the city's current theatre scene. From the late 1700s into the 1830s, Philadelphia was the center of theare in America, and, while New York may have stolen a bit of the limelight after that, it carried on this strong tradition throughout the remainder of the 19th century. 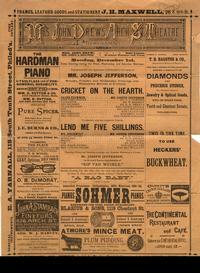 In fact, over 100 theatres opened in Philadelphia in the 1800s alone. 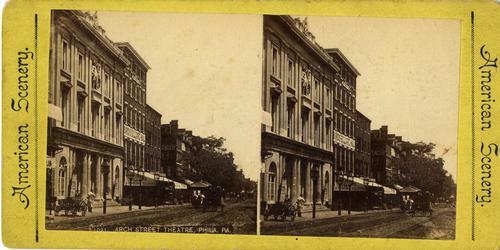 Some, like the Chestnut Street Theatre, the Walnut Street Theatre, and the Arch Street Theatre, became well known for the quality of their performances and lavish buildings. The Chestnut Street Theatre, also known as the Philadelphia Theatre, opened in 1794 with capacity for 2,000 audience members, and in 1816, it became the first theatre in America to be lit by gas fixtures. The Walnut Street Theatre, which is the oldest continually operating theatre in America, had multiple managers, like most theatres at the time. In 1834, Francis Wemyss took over and renovated the lobby to project strong patriotic themes, which may be why the theatre was sometimes called the American Theatre, Walnut Street during his tenure as manager. While the building has been remodeled a few times since it opened in 1809, audience members can still get a sense of the history thanks to a renovation in 1969 that restored the ornate 1828 facade. The Arch Street Theatre was not only home to great performances, it was also the first major American theatre to be managed by a woman. Louisa Lane Drew, also known as Mrs. John Drew, was born into a theatrical family and began her own acting career at age eight. 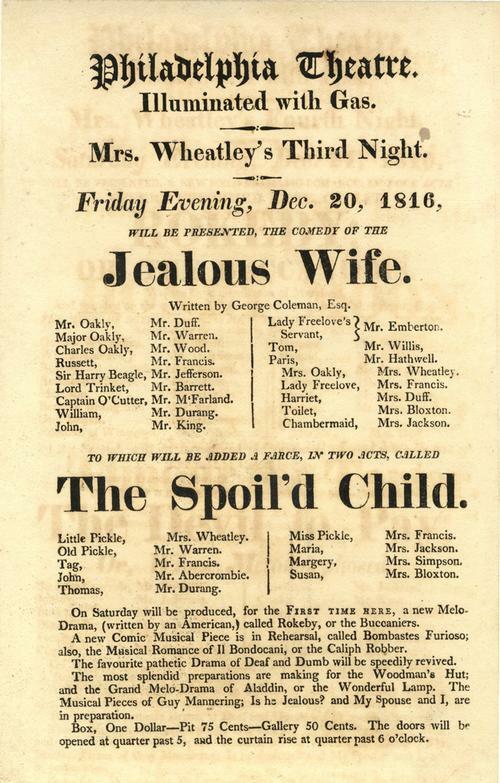 In 1850, she married fellow actor John Drew and the couple settled in Philadelphia. 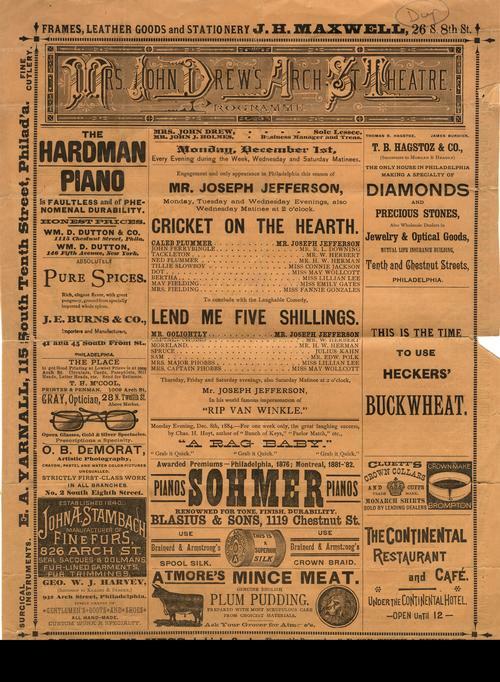 Ten years later, after John's failure at managing the Arch Street Theatre, the stockholders turned the theatre over to Louisa. "The Arch" thrived under her leadership and became known as Mrs. John Drew's Arch Street Theatre, banking on her fame to draw in an audience as she continued to perform. In 1892, she retired from active management, and through her five children, she ultimately became the matriarch of one of the greatest acting families of all time: the Barrymores. But it will not just be these theatres discussed in the exhibition, but patrons will need to stop by to learn more. 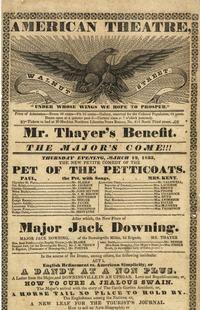 On view will be playbills, photographs, and other ephemera giving a bit of historical context to Philadelphia theatre today. In addition to this exhibition, the Free Library's Literature Department is partnering with the Philadelphia Shakespeare Theatre to host "Shakespeare in Love: Open-Mic Poetry Night" in the Skyline Room of the Parkway Central Library on Valentine's Day, February 14, 2018 at 6:00 p.m. The event is free, but an RSVP is required. Philly Theatre Week's Partners and Sponsors include TodayTix, Time Out Philadelphia, WXPN, Yards Brewing, Wyncote Foundation, Philadelphia Cultural Fund, and the Dolfinger-McMahon Foundation. 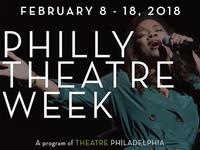 For more information on the other events and to get tickets, check out Philly Theatre Week's list of events.